That’s me, on a South African train, heading to the end of the world. Trying to be brave and confident in an environment that scares me. 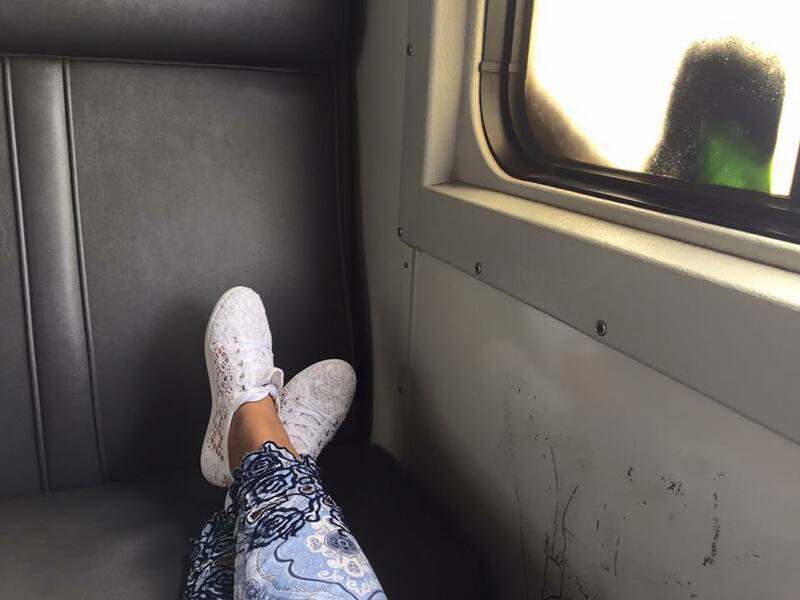 I heard so many horrifying stories about single women, traveling alone by train in South Africa. That’s why I already placed a smile on my face, hoping to look friendly, but tough. 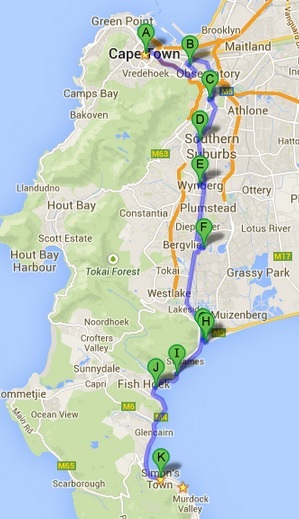 Keep fingers crossed no one to get any closer during my 70 minute journey from Cape Town to Simon’s Town. I was properly instructed by some local mates how to behave, what to do and what not to. Usually I have no fears, busy to enjoy life and curious to discover it, but this time too many warnings, too many things to be cautious of, too much advice… I got the impression every trip by train in South Africa finishes dramatically, mainly in a bad way. Jumping on that train, I immediately faced three opportunities ( in regard to my mates’ directions) – to be robbed, to be raped or even better, to be killed. Thank God, the reality was not as scary as the tales were. Here I am, on a dirty, yellow, slow running, covered by graffitis train, an experience what I find extremely unusual and quite exciting. Have you ever been at the end of the world? I have. The end of the world is about an hour drive by car from Cape Town, South Africa or 70 minutes by train. I am sure you have already heard the ultimate end of the world’s name – Cape of Good Hope (Cape Point). The gentle name has nothing to do with the sharp cliffs, where stormy waves hit the shore all year round. A rough nature, with no mercy and probably the hope is the only one able to live in there. I was really curious to visit it and then to proudly say: “You know what, I was at the edge of the world!”. I should assure you the trip itself to the end of the world is worth it as well. Here I’ll be mostly focusing on that particular journey. It’s colourful, crazy, odd, surprising, unusual, exciting… It opens your eyes and makes you impatient to see more and to taste more. The foggy dirty windows of my yellow train were not transparent enough to show the outer scenery, but the most of them were likely broken, missing or deeply scratched. The train stops every five minutes at a different station. 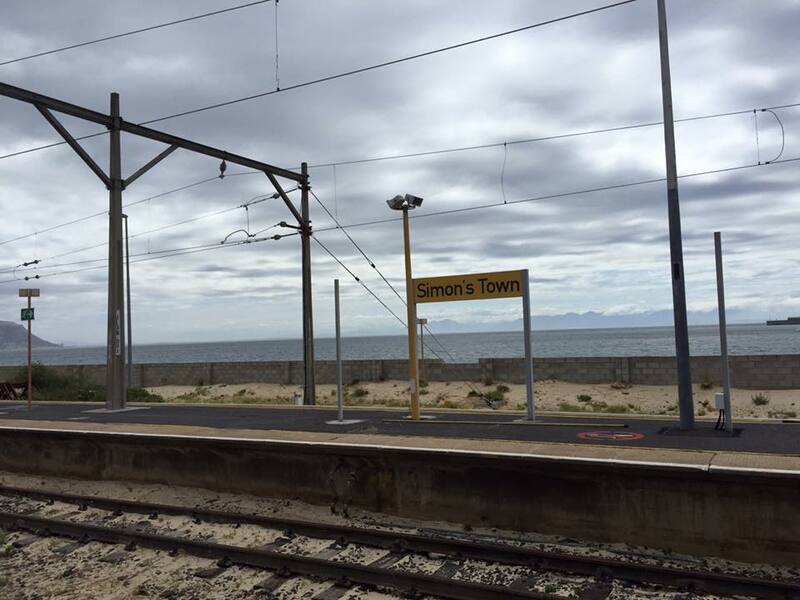 The railway follows False bay line, right beside the ocean, so it’s a real pleasure to watch the little peaceful towns and villages on the route. As I was advised, I bought a first class ticket for that train. Then I became a bit hesitant which carriage to get in, as all of them looked similar. 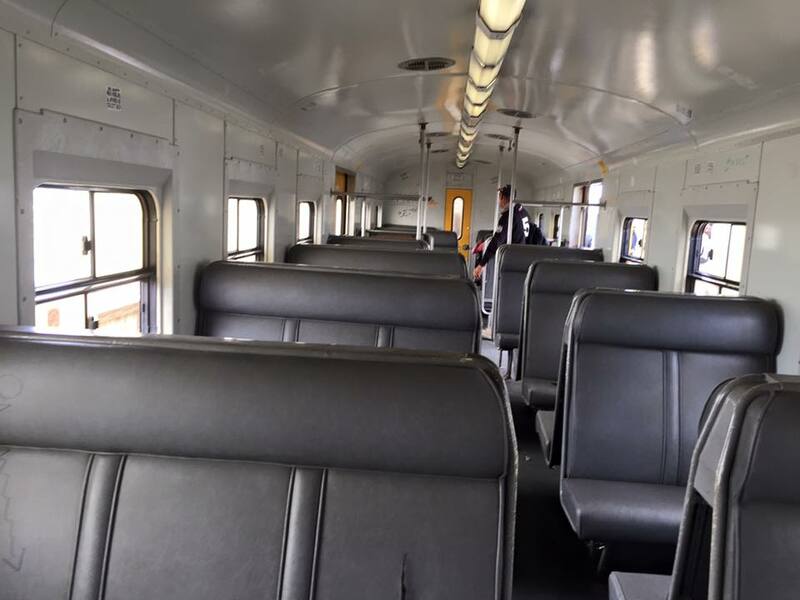 The first class carriage was completely unnoticeable, poor looking and unrecognisable. To me it looked mostly like third class in an European train (I am not even sure we have third class in Europe). 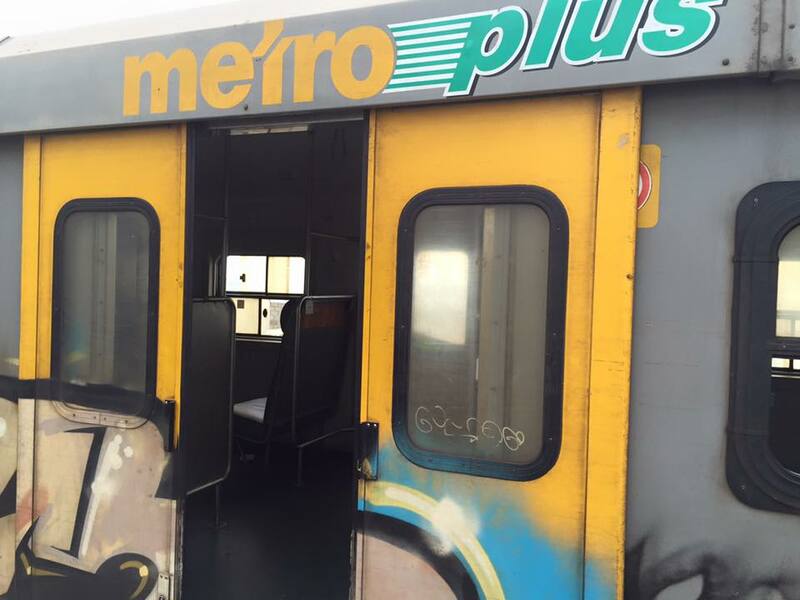 The price was not first class neither – about 16 South African Rands one way, less than an Euro. With the inflation speed in South Africa, I guess same ticket could reach soon 50 eurocents. The leather seats were torn, scratched and with questionable hygiene. But to be honest, I saw cleaners brushing the floor, after the ride was completed. So it’s not that bad and if you just ignore the poor surroundings, could really enjoy the ride. By my observation, following the logic and the map, on this side of the peninsula must be located the Indian ocean. But my friends in Cape Town said everywhere is just the Atlantic. They suggested the Indian ocean could be seen and experienced only close to Durban. Everything around Cape Town and nearby is still the Atlantic. Whatever ocean it is, it’s freezing. I did not expect that in the middle of the summer. In February it’s still the South African summer, but the maximum temperature of the ocean remains about 18 degrees C. Could you imagine how cold is it? I was told, if I aim a warmer ocean experience, I should go to the city of Muizenberg, where the water is expected to be about 21 degrees C. Still too cold for my taste. I met a mature lady from Scarborough, who explained to me the summer temperature phenomenon. The ocean here is supposed to be much warmer during the winter season, instead of the summer. The reason comes along with the icy water, leaking from the icebergs next to the South Pole during the summer (I told you I was at the edge of the world). The ocean waves the melted ice closer to the South African coast. That’s why the ocean was colder during the summer. It’s a real pity, because Cape Town and the nearby towns have incredible beaches with white thin sand and stunning views, but I don’t find much appealing the freezing water. Did I tell you the train was turned to a hop off /hop on touristic transport? Just for double price you can buy a ticket, that let you hop off at any single station, look around, grab a snack or beer, walk and mingle, then hop on the next train to the next stop. It’s really worth it, because these little stops are lovely. My favourite one was Fish Hoek. The greatest fresh grilled or fried fish ever. I loved that place. Very authentic, nothing pompous, natural and peaceful. I was able to stay and stare at the ocean for hours, sitting at the shore, eating fish and drinking beer. 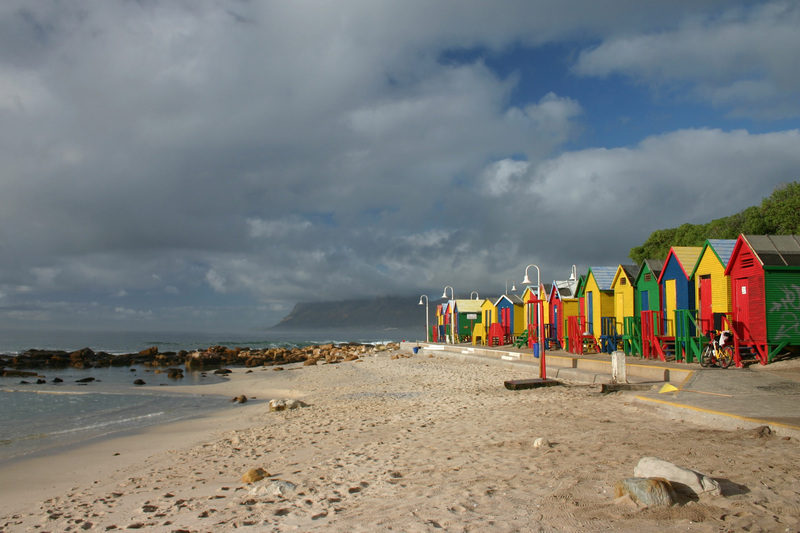 Just before Fish Hoek, St.James with its craft shops, colourful beaches and vocational spirit fascinated me. 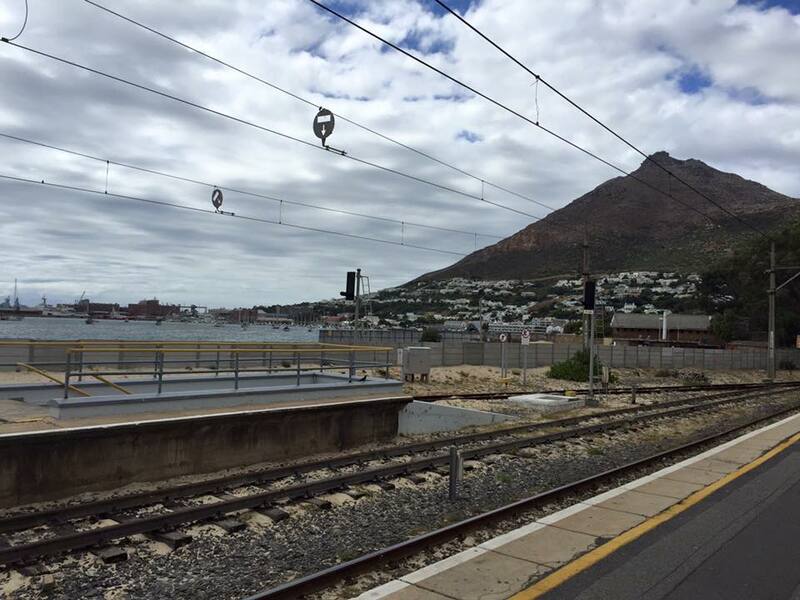 In the very begging of the train route stands Muizenberg, that I would highly recommend to be hopped off. Muizenberg is the centre of all water sports and attractions. If you intend to get some kite or wind surfing lessons, that’s the place. Fantastic food and coffee shops around. A very colourful hippie culture and atmosphere surround Muizenberg’s guests. Be aware of the shark threat, though! You’d see everywhere alert notes, requesting your cautiousness and awareness of possible shark attacks. The surfing costume is a must, because of the cold ocean water. The equipment is kindly provided by the instructor and is included in the final class offer. Most of the instructors are Australians, very laid back and relaxed guys. The beach is spacious and flat, usually overcrowded by people. I just missed out a point. The train doesn’t run on a strict schedule. So be prepared to miss the next one. Usually at the train station there is a black board, where should be written by hand the approximate flexible schedule. Better check on it and memorise the exact start time of the next train. 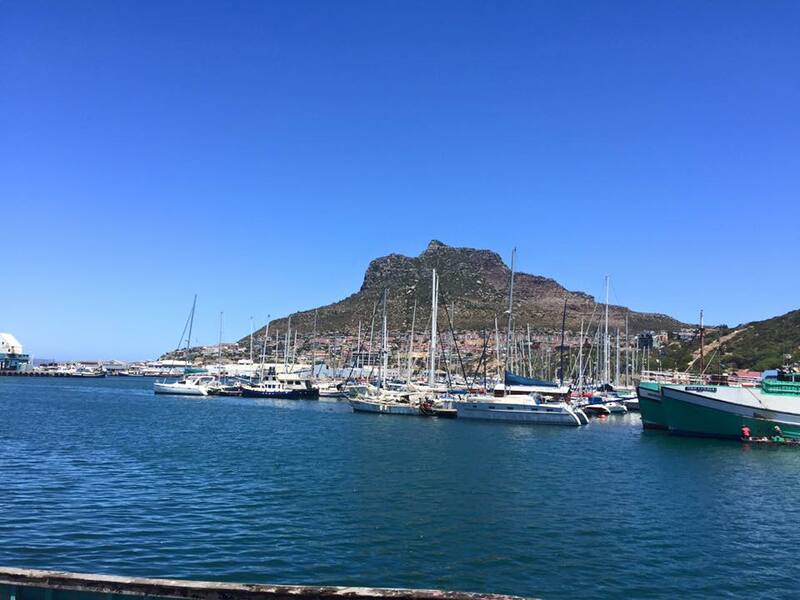 The last stop on the route is Simon’s Town. I can’t say I was smitten by. But the feeling, being at the edge of the world, was definitely tickling me. Simon’s Town is famous for its huge seals colony. Could be seen also lots of penguins in here. It’s a real pleasure to watch the seals playing and being fed. Very windy, this place offers one of the best cloud sceneries, especially after sunset. On the way back to Cape Town, I got the distance to the first two stations on foot and caught the train somewhere in between. It was a unforgettable journey, with rocky mountains on the left, ocean view on the right, in between the railway snake with that hippie train on and the colourful towns, where the time has stopped. I can’t explain it, but being at the end of the world and knowing I am there, was a wonderful feeling. For the locals it’s just their daily routine. They don’t even realise how awesome to rest of us the location seems. No one living permanently in Simon’s Town feels exceptional or peculiar for being one foot closer to the world’s end. After those simple words, I felt truly blessed and got a hunch this journey was meant to be. I was relieved for being able to see the magic and the miracle in far not heaven spots. The trip to the end of the world actually made me see through how lucky I was for being just right where I was.